Well, now we are getting fancy. 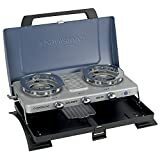 The Campingaz Chef is a double burner stove and grill, which can house frying pans and food on a grill plate. For when you’ve got a few hungry campers to feed, or for when you’re throwing a tent party, the Chef is an awesome choice. 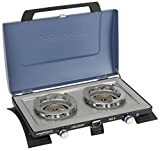 The Campingaz Chef Double Burner Stove and Grill is self-contained in its own carry case, and runs on gas canisters. 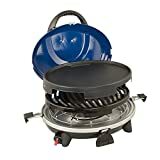 The Campingaz Chef Double Burner Stove and Grill isn’t really made for hiking over long distances, it’s pretty heavy, at over 4kg. That said, it stores flat and neatly in the boot of your car, so if you’re off on a weekend camping trip, once it’s out and on-site, the Chef really is no trouble at all.